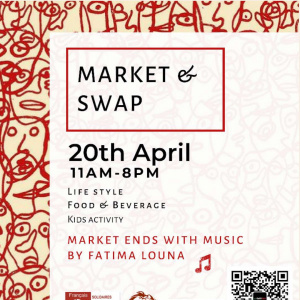 On the 20th of april, from 11am un Caffè Bar market is back highlighting amazing handmade and design artisans in the fields of fashion, jewelry, food, accessories, mini arts workshops and more! The Un' Market is a unique event to connect the makers of beautiful things to people who appreciate the unique and handmade. At 11 am on April 20th, the un Caffè Bar market has returned to the market, from fashion, jewelry, food, accessories, mini art studios, etc., to the amazing and hand-crafted masters and masters. Come to the eye to bring goods! The unique Un' Market market, which combines exquisite art and unique craftsmanship, makes people who love hand-crafted and unique tastes, intimately connect and share the love of life. If you want to sell something secondhand or swap your clothes send us a message in advance so we can set up a table for you! If you also want to exchange or sell your second-hand products, please contact us in advance to reserve a seat.